Mobile users acquired through “incentivized” installs can be valuable, according to a new study, if managed properly. The term refers to users who download a mobile application in exchange for something else – usually in-game virtual currency or goods. Traditionally, these sorts of users are thought of as somewhat disposable, simply serving as a way to boost an app’s rankings in iTunes…at least until Apple cracked down on the now-banned practice. But a new study of mobile app traffic shows that, in certain cases, incentivized traffic can outperform organic traffic. Unfortunately, given the report’s source, it still leaves us with quite a bit of doubt. The study was performed by W3i, an application distribution and monetization network. And what does W3i engage in? Yes, incentivized installs. Well, sort of. Given Apple’s ban, W3i now focuses on promoting free-to-play applications through its mobile ad platform. It’s a kinder, gentler way to encourage installs that’s quite different from how its original incentivized installs program worked. That said, to claim that W3i doesn’t have the world to gain by promoting the benefits of incentivized installs would be naive. But let’s look at the data. 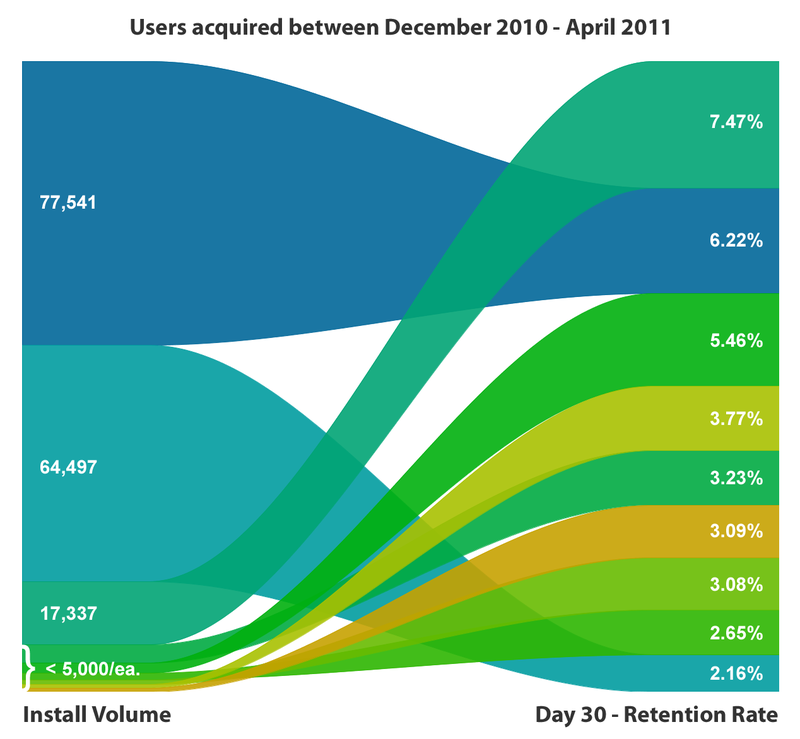 Between December 2010 and April 2011, W3i looked at the 30-day retention rates per traffic source for one of its burst campaigns for a popular game. It also calculated the volume per traffic source (see below chart, each color designates a different app). The top paid volume source (77,541 installs) produced the second best 30-day retention rate (6.22%). But the second-top volume source (64,497 installs) performed the worst (2.16%). Both were incentivized traffic sources, but both had dramatically different retention rates. Clearly, not every traffic source is the same. In this case, the traffic sources were individual applications where the game was being promoted. One app led to higher retention rates after a month than the other. Revenue, too, saw similar trends. (The letters refer to apps, whose names can’t be listed). 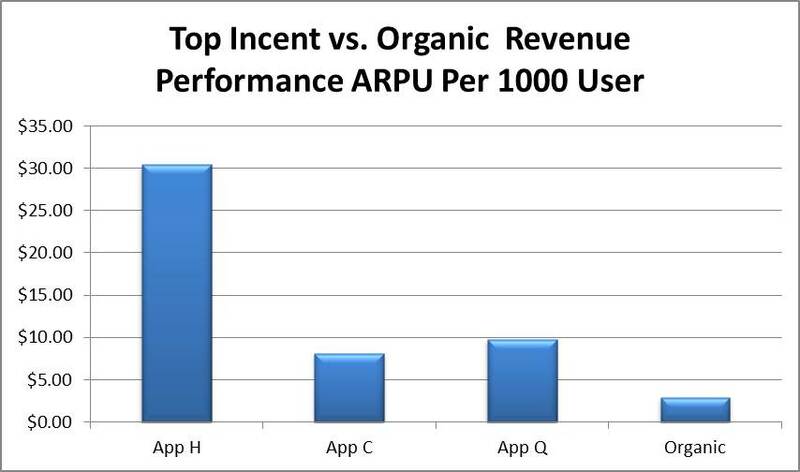 In addition, there were even cases where the organic traffic performed worse than the incentivized traffic, in terms of ARPU (average revenue per user). 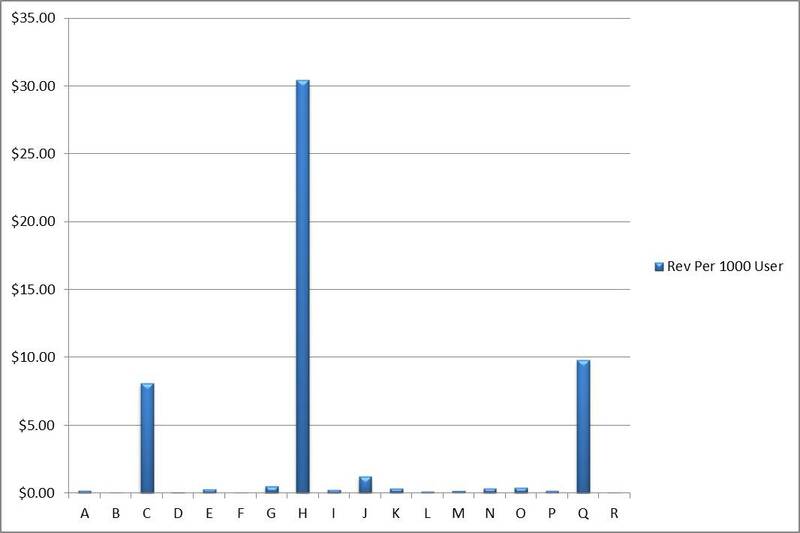 Unfortunately, while this (far too narrow) slice of data does seem to show that incentivized installs aren’t necessarily the monster that Apple makes them out to be in all cases, the source of this data is suspect. It would be interesting to see a broader study from a less-biased company. In the meantime, the big takeaway from these findings is that incentivized installs, can, in fact, deliver valuable new users for some when implemented correctly. But how regularly does that happen? In what apps? What’s the general trend here? Were these findings a fluke or par for the course? These are all questions W3i fails to answer with this study, instead showcasing trends for a single game. Not good enough to prove Apple wrong, we’d say.